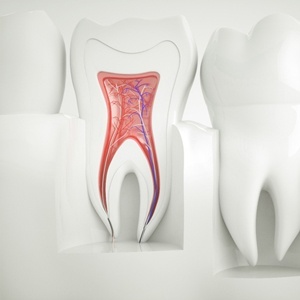 Do you have a damaged tooth giving you grief? Do not have it pulled! Edgewood Dental can save it with a root canal in Michigan City. Although they have a bad reputation for being painful, you have nothing to fear. Our office embraces the latest technologies and techniques, so they are no worse than a traditional filling. We will rehabilitate the health, function, and appearance of your tooth to save your smile. A root canal is an endodontic procedure that extracts the inner layer of the tooth, called the pulp. This stops the spread of infection while restoring the tooth’s health. 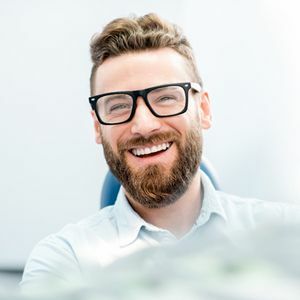 There are over 15 million root canals performed annually because they provide nearly a 90% success rate when performed by a trained professional, like our team at Edgewood Dental. Although they are common, we only recommend them when there are no other viable treatments to save your tooth. Swelling of the gum tissue near a tooth. Pimple-like bump appearing on the gum near a tooth. We schedule you for your treatment after your initial consultation. We can often complete the entire procedure in just one appointment using advanced technology. 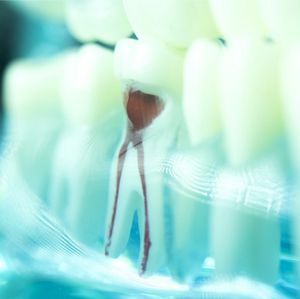 First, we remove the areas of damage and extract the pulp from your tooth. We sterilize your tooth to kill any harmful bacteria before it is sealed using a special material called gutta-percha. This helps to prevent bacteria from entering your tooth while also adding some strength to protect its structure. Now that its health is restored, we give it an added layer of protection and rebuild its appearance by placing a crown over it. We take a digital impression of your mouth to get the exact measurements necessary to create a custom-made cap. We offer CEREC same-day crowns, so you can get the restoration you need in one day. The impression integrates with our CAD/CAM software, where we set the specifics for your crown, such as the size, shape, and color. The information is sent to our in-office milling machine. Your crown is cut from a single block of all-ceramic material in less than 1 hour. You will walk out of our office with the health, function, and appearance of your tooth fully restored. There is no need for a temporary crown or a second appointment to save you valuable time. After you leave, it is normal for your tooth to be a bit tender for a few days. You can manage your discomfort by eating soft foods and taking an over-the-counter pain reliever. In no time at all, you can chew on your tooth without any concern. If you have a damaged tooth, do not have an extraction! Your dentist in Michigan City can save it with root canal therapy. Contact our office today to schedule your consultation.